The 19th Century was the peak of hop growing and drying in the UK. The majority of surviving kilns and oasts date from then. This was the era of the round kiln or roundal. Volatility was a continuing feature of the hop business. Production expanded sharply during the Napoleonic wars but then slumped in the 1820s. Prices reached £35 per cwt at Southwark in 1817 but then never went above £4 per cwt in the next 6 years. £5 per cwt was much more typical through to the 1830s than the occasional peak year at £20 plus. Overall it was a period of confidence in progress. Hop growing and drying were the subject of innovation, entrepreneurship and research. In the final years of the century Sir Charles Whitehead, Kent farmer and regular contributor to the Journal of the Royal Agricultural Society ((Vol 51, 1890) reported that there had been improvements in cultivation, drying, bagging and general management. “Far more money has been made in hops than any other branch of agriculture” in the last 50 years. In an earlier article in the Journal Whitehead urged growers to use the utmost energy “to drive the foreigner from the field”. The acreage given over to hops doubled from 35,000 in 1800 to a peak of 72,700 in 1875. There was a gradual consolidation of hop growing focused on the favoured conditions of Kent and Surrey, Hampshire, Worcestershire and Herefordshire, though hop growing and drying could be found scattered across the country – see below. Hop kilns and oasts may be waiting to be discovered in surprising places. Many new varieties of hop were introduced in the 19th C. Goldings and Fuggles were widespread in Kent, the later introduced in 1875 by Richard Fuggle of Brenchley in the High Weald. There was a strong sense of competition between the hop growing regions as to who was best, in part revolving around regional preferences for different varieties of hops. All stages of hop growing and drying were the subject of experimentation and technical advance. The introduction of metal wire transformed the systems of poles and stringing in the hop garden or hop yard. Whitehead reckoned that the growers and dryers of the West Midlands were more technically advanced and imaginative than those in the South East, even though he himself was from Kent. 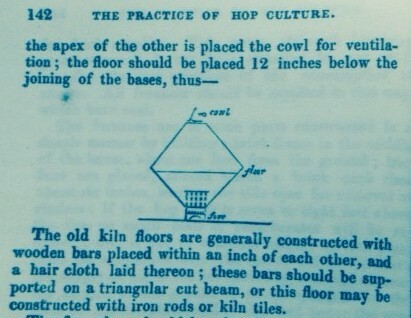 E J Lance wrote The Hop Farmer in 1838, perhaps the most comprehensive guide since Scott in the 16th Century with a good overview of the art of hop drying as it was in the 1830s, a period of rapid expansion. He asserted that “the flavour of hops is inimitable and unattainable by any substitute whatever“. He reported that one of the treatments of the maladies of King George III was to give him a pillow stuffed with hops when all other opiates failed. Lance’s description of the good drying of hops is not significantly different from guidance through the previous 100 yeas or more. He recommends that the hops are laid 1-2 feet thick on the drying floor above an open hearth burning smokeless fuel. The management of a draft of air, heated in the plunum chamber and rising through the hops is an important part of the dryers task. It is worth bearing in mind that mechanical fans to create draft did not arrive until the end of the 19th Century. Lance describes barn style buildings with internal kilns as the” old style of drying”. Rather, the hopper kiln consists of two pyramids placed base to base with the furnace at the bottom apex and the cowl at the top. There is also mention of two drying floors, so that the hops start off on the upper floor and then are pushed through to the lower floor to complete drying. It is unlikely that this became common in the 19th C although it was taken up in the 20thC. 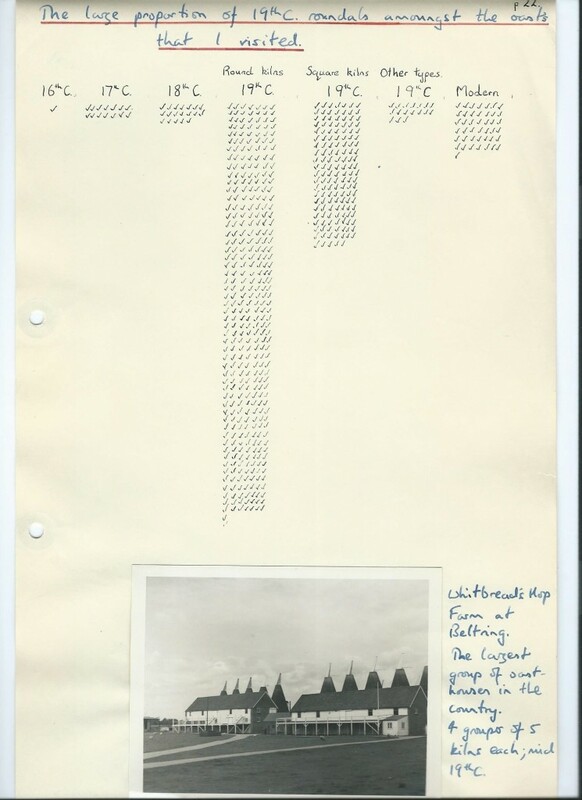 Lance calculates that the cost of drying is about 14 shillings per 1 cwt (hundredweight or about 50 kilos) made up of kiln hire, fuel and labour. 100 sacks of charcoal are needed to dry one ton of hops.The whole process of hop drying was influenced by the weather, especially how much humidity is absorbed during cooling. He recommends leaving the dried hops on the cooling floor for 3-4 days. Evidently the primitive practice of leaving hops out in the sun to dry had not died out even in the 19th Century because Lance condemns it as unsatisfactory. 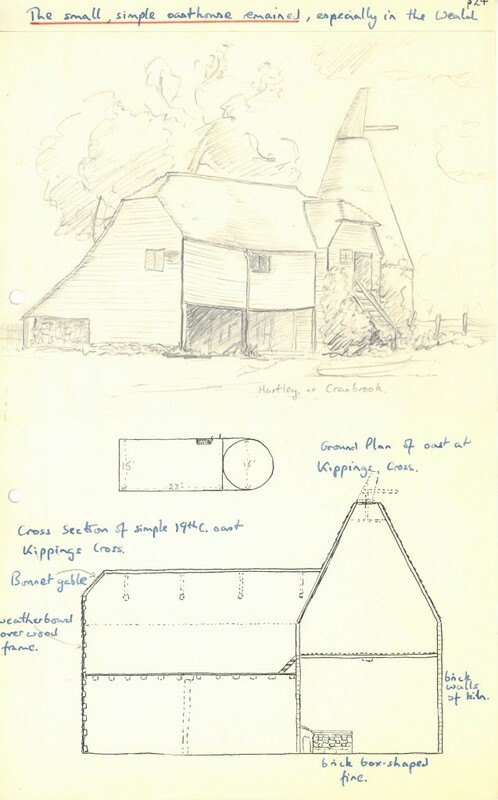 Oasts and hop kilns shared in the technological advances of the 19th Century. Experimentation with kiln design took off in the middle of the century. Building in brick was given a boost with the abolition of the Brick Tax in 1850. Lance reports on a building near Farnham which sounds like a fore runner of the mechanised 21st Century driers. Above each of 8 charcoal burning hearths were stacked 4 trays, 10 x 7 foot with horse hair bottoms, so that the hops were passed successively from the top to bottom tray. The site of this fuel saving system is not known. Other experiments were with boilers that heated water to pass steam through a network of pipes below the drying floor (see The Age of the Roundal and Furnaces). The introduction of powered fans meant that the warm air could b e blown up through the drying floor or sucked up from above. At first fans were driven by attaching a belt to a tractor or other farm machinery. Fan assisted draught greatly increased efficiency. Fans also meant that new types of heaters could be installed outside the kiln with hot air blown into the kiln mechanically. Another introduction was a roller horse hair mat on the drying floor. This way the dried hops could be drawn off on to the cooling floor without having to shovel them with inevitable damage from manhandling. Lance lists all parishes where hops are grown in 1835 with the acreage . Outliers included 5-20 acres each in Devon -5 parishes, Cornwall 8 parishes, Dorset 2 parishes, Bedfordshire, Bath, Bristol, Cambridge, Chester, Northampton, Reading, Watford and mid Wales (115 acres in 15 parishes mainly along the border with Herefordshire). More substantially there were still 342 acres in 20 parishes in Essex, mainly in the north east of the county, 154 acres in 15 parishes in Suffolk and Lincolnshire with 570 acres in 25 parishes. The West Midlands was well developed: Herefordshire dominated with 11,646 acres in 164 parishes. Bromyards, Bisops Frome, Bosbury Cradley, Leominster and Tenbury all stand out, each with more than 300 acres. 53 parishes in Worcestershire had 2,680 acres. Suckley, still with thriving hop yards, was the only parish with over 200 acres. The Farnham area was still quite modest at 1500 acres in 30 parishes. The statistics show how Farnham itself dominated: 900 acres in that one parish, out of 1500 acres. 332 parishes in Kent had 24,000 acres of hops and 102 parishes in East Sussex had 11,380 acres. The figures show the concentration in the High Weald at Benenden, Cranbrook,Hawhurst (530 acres), Marden, Goudhurst, Horsmonden, Rolvendon and Tenterdon. The other concentration was the River Medway Valley above Maidstone: Yalding with 911 acres, East Peckahn, Hadlow (over 600 acres each), East Farleigh, Wateringbury and Wrotham. Mr Ellis of Barming (now the western suburbs of Maidstone) was the largest individual grower with 500 acres. Hop gardens extended into what are now the suburbs of South East London. There were 65 acres in the Orpington, Bexley and Bromley countryside. All the oasts there have gone. It is striking to note that in the mid 19th Century exports of English hops went to all corners of the Empire, notably New South Wales. The Australians developed an early taste for beer. But the largest quantity of exports was to Germany and Scandinavia countries whose exports of dried hops to the UK would represent a great challenge by the end of the century. There were low levels of imports up to the 1860s but the ending of customs duties in 1862, and therefore the protection of English hops, opened the way to imports from North America and the Continent. As with other branches of agriculture the organisation and economics of the hop business was political. The structure of the market to sell hops from growers to brewers was dominated by a small but powerful group of middlemen called Hop Factors, mostly based in Southwark. In the 1860s there was an experiment with an organised, open Hop Exchange, but it did not last. Much small scale trading between growers and local brewers went on. All the while tastes in beer were evolving, generally from heavier to lighter brews which required less hops. Excise and customs duties and tithes on hops were regular sources of aggravation and demonstration. Industrial scale brewing developed in the 19thC, coming to exercise a influence on the market. Guinness, Whitbread and others went into hop growing and drying to control the supply of their own raw materials. One of the largest groups of oasts was at Beltring, Paddock Wood in Kent. This was purchased by Whitbread in 1920 and expanded. A total of 38 round and 6 square kilns were built there, mainly coke or coal fired. Investment in new drying techniques continued to the 1980s but operations ceased at Beltring in the 1990s. It is now the Hop Farm Family Park. After the 1870s decline set in. By 1900 acreage had fallen to 50,000. Foreign competition became a serious concern with around 25% of demand from brewers met from imports. East Kent (Canterbury, Ashford, over to Hawkhurst and Smarden 7,544 acres.East Sussex 8138 acres. For all the advance of technology and scale in the 19th Century much hop growing an drying went on much as it had done in the previous two centuries. Small oasta with a simple stowage and one round kiln at the end to be seen scattered across the countryside now testify to that .